This week we talk to the manager of an Ecuador Amazon eco-lodge with a difference – they want you to see oil and destruction as they try to save the rainforest. 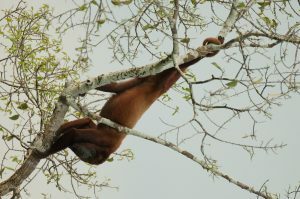 Most Amazon trips offer a spectacular visit to the highlights of the Amazon – wildlife, community life and comfy lodges. Huaorani is an Amazon eco-lodge that wants you to see oil, pipes and rainforest damage. The villagers do not want to hide the scars on their land, Yasuni National Park, said to be the most bio-diverse place on earth and still home to uncontacted tribes. So, having spent three or four days spotting monkeys, toucans, macaws and other Amazonian wildlife, and learning the ways of one of the Amazon’s indigenous tribes, the journey out from Huaorani is an eco-smack in the face. On the Auca Road built by the oil companies in the early 1970s, guests witness miles of oil pipelines in Ecuador’s rainforests and the damage that oil exploration has done to the forest and Huaorani hunting grounds. Jascivan Carvalho, general manager at Huaorani eco-lodge, said: “This is a story whose narrative is preserving a people in nature by keeping oil in the ground. A ban has been lifted on drilling for crude oil in one region of the park, an exercise that may well lead to exploitation of indigenous peoples, wildlife, the forest canopy and more, according to Jascivan. Jascivan said: “Indigenous groups with their own conservation efforts should be a source of national pride. And yet there are reasons for optimism. “The canopy is re-appearing over sections that were slashed and burned and along the rivers,” Jasciavan continued. Yasuni National Park has been since 1989 a UNESCO Biosphere Reserve that is home to as-yet un-contacted indigenous tribes, including the Tagaeri and the Taromenane. Amphibian (121 documented species), fish (382 known species), bird (596 known species), bat (117 species estimated) and insects (over 100,000 different species) abound here in numbers not found elsewhere on earth. This is thanks to a diverse and richly textured flora and fauna (up to 720 estimated endemic species and over 4,000 species of vascular plants). Species of vertebrates number 43. “By bringing visitors to them, the Huaorani become the world’s greatest advocates for conservation – of land and of peoples,” says Carvalho.